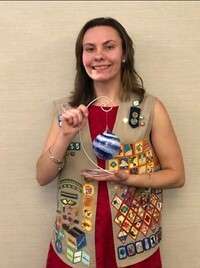 Keystone Oaks senior Tori Campbell recently earned Girl Scouts highest award, the Gold Award, for her extraordinary leadership skills and efforts in organizing a free student field trip to the Pittsburgh Glass Center. Tori is an active member of the Keystone Oaks High School Art Club and currently serves as the club’s Activities Coordinator. She want to expose her fellow students to a new form of art and, in working with Pittsburgh’s Historic Glass Club, Keystone Oaks Superintendent Dr. Stropkaj, Art Teacher Heather Hruby, and others, she was able to secure nearly $750 in funding, including admission and transportation costs, to bring 13 students to the Pittsburgh Glass Center for a two hour class that gave students the opportunity to blow their own glass ornament and take a tour of the facility. “Through this process, I learned that being a leader means working with others to make your goal a reality,” Tori said. “I learned so much about how to approach others obtain permission, securing funding, and how to overcome obstacles along the way. These are skills that will help me have a positive impact on the community in the future,” she added. The Gold Award is a national award, with national standards, and represents a Girl Scout’s time, leadership, creativity, and effort to improving her community. Gold Award projects also provide girls with important leadership skills.